Camping is always an exciting activity that everyone in the family enjoys. After all, who doesn’t like being in the outdoors and experiencing the relaxing feeling of spending more time with nature? Just be sure to bring along with you the reliable camping tents that can keep you comfortable enough during your trip, and you will have an amazing time at camp. 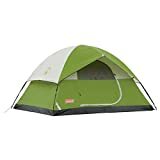 So, check out these best family camping tents and choose the perfect item that you can use for your upcoming outdoor trip. Planning to go on a camping trip with the family? If so, then this 4-person spacious camping tent is just the right item you need. 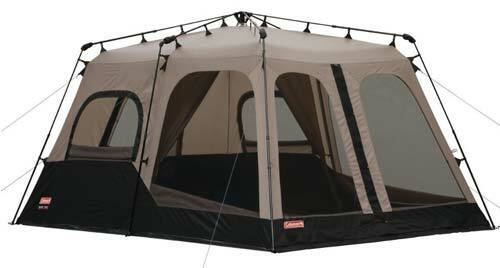 It features large windows and ground vent that allow air to circulate well inside the tent to keep you comfortable. What’s more, it offers ample space inside, so you can have sufficient room to set up your sleeping bags or move around. It is also worth noting that this tent is quick and simple to set up. In fact, all it takes it 15 minutes, and your tent is ready! There are snag-free pole sleeves that facilitate easy setup, and there are some storage pockets inside to organize your tools and equipment. Lastly, moisture stays out, thanks to the WeatherTec system, which features inverted seams and welded floors. Got a large family but no spacious tent to fit everyone in? 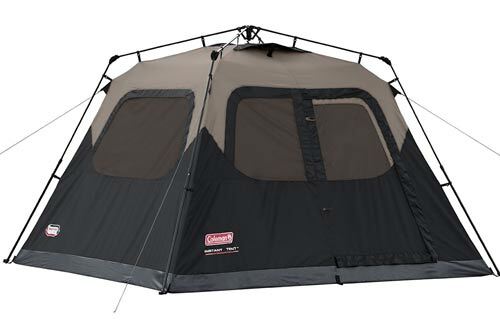 With this 8-person tent by Coleman, you can have enough space for the whole family – and perhaps even your pet! This camping tent is very spacious as it can accommodate as much as 8 people inside. It also features two rooms, so you can have some privacy even when you are camping outdoors. Assembly is a breeze with this tent as there are poles pre-attached to the unit. So, you can have this tent set up in about 1 minute. There are also 7 windows and 2 doors for proper ventilation. The floor has a welded feature and there are waterproof thick walls to keep everyone dry and warm while inside the tent. 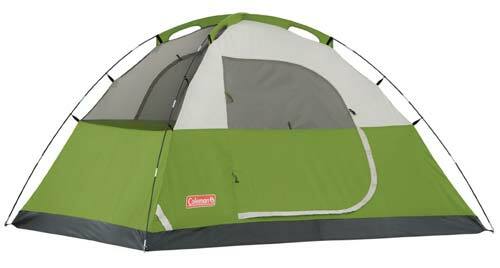 Another roomy camping tent to consider for your trip is this product by Coleman. It comes with a stunning cabin design that makes it quite attractive and unique from other styles of tent. 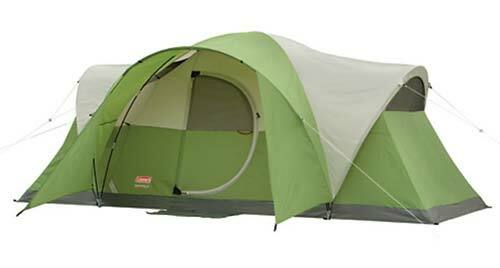 You can count on this tent for your long camping trip, all because of its durability and sturdy components. In fact, it even has an electrical access port, so that allows you to stay in touch using your mobile devices and other technology tools while on your trip. 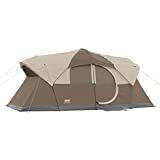 Other outstanding features of this tent include the hinged door, angled windows and door awning for sun and rain protection, and the WeatherTec system to keep moisture or water out the tent. The roof comes with a mesh fabric to let the sunlight in when the weather is pleasant. Enjoy the experience of spending time in the outdoors, thanks to this canopy tent that you can bring along for your trip. 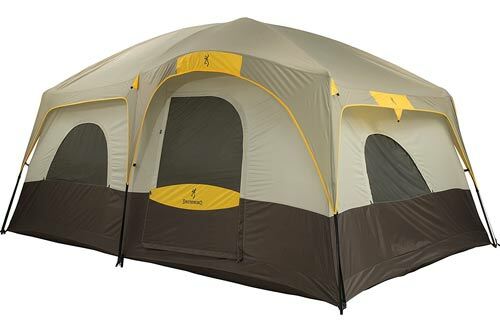 This large and roomy tent is a 10-foot portable canopy, which covers a spacious area of 100 square feet. You can have enough space to fit everyone in, so this is a suitable tent for a large family or a group of friends. As for the materials used in this tent, these are all waterproof and fire retardant for your safety. Moreover, it can block as much as 99% of harmful UV rays. So, you can be sure that you are well protected while nestled inside this high-quality tent for your outdoor experience. 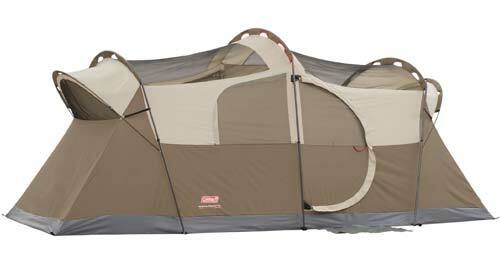 Choosing the best camping tent is made easy with this nifty 6-person tent by Coleman. It offers a spacious interior, which is enough to hold 2 queen size airbeds. This should be enough for a family of 6, and space is ideal to keep everyone comfortable without feeling cramped. It is easy to assemble the tent as it comes with pre-assembled poles. There are also interesting features that you will like about this product such as the “illimiline” reflective lines for enhanced visibility during nighttime, vented rain-fly to ensure protection from harsh weather and welded floors to keep moisture out. Going on a camping trip? 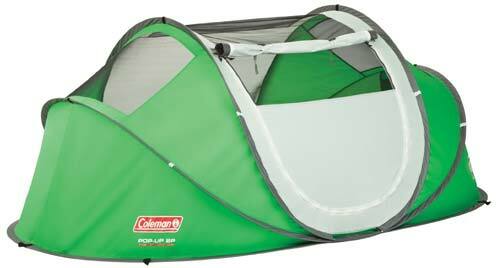 Never leave home without this pop-up tent by Coleman that is good enough for two people. 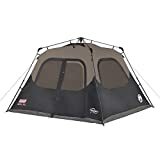 This is perfect for a short camping trip as it comes with just the right features essential to keep you comfortable and safe inside. For instance, there is a taped floor that keeps the interior dry, plus the rain-fly ensures additional ventilation and protection. Setting up is not a hassle with the pre-assembled poles. 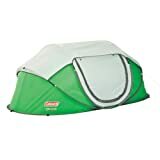 After use, you can just pack this tent up flat and store it easily in your trunk or closet. 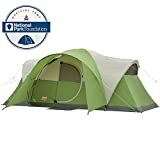 Great for a much as 10 campers, this tent has enough interior space for you to move around and place your sleeping bags. It has two rooms, which is excellent when you are camping with a large group of friends or family. The interior comes with impressive and functional features such as the WeatherTec System to keep you comfortable and dry, the Insta-Clip attachments and storage compartments. The materials used in this tent are durable and reliable. 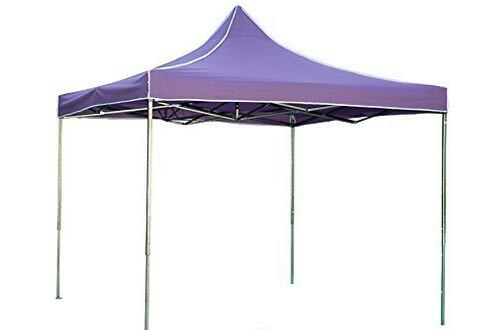 These include fibreglass shock-corded poles, continuous pole sleeves, 75 denier polyester material, 68 denier mesh made of polyester and tent floor constructed out of polyethene. 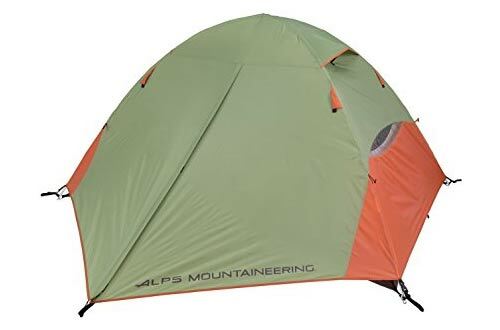 Make your camping a comfortable one by bringing along this tent with you. It is a breeze to set up with its pole clips and a 2-pole system made of fibreglass material. All you need to do is to snap the pole clips over the tent fibreglass poles, and you are all ready for camping! 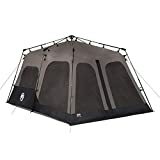 Great components include the UV-resistant polyester fly, taffeta floor equipped with 2000-mm coating, doors with mesh zippered windows for ventilation and two spacious gear storage. There are also roof vents for stargazing, which also serve as vents. It should never be a problem to pack 8 people inside this tent because it is spacious and durable enough – just the way you like it. 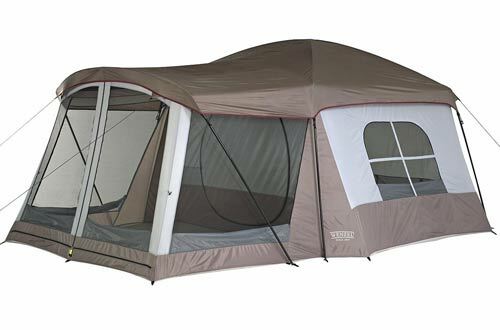 It comes with a screen room attached to the dome tent, which is great for privacy. This product is also made of high-quality materials such as polyester that resists harsh weather, as it comes with a polyurethane coating. 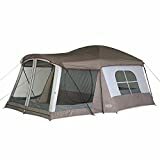 This tent remains stable and set in place with the double-stacked “power corners”, and there is also a screened area inside that functions as another sleeping or as a sunroom. Topping this list is this amazing camping tent that is great for the whole family. It is stress-free to assemble, has a 3-pole design that is free-standing, and it is equipped with steel uprights and fibreglass poles. There is also a wall divider to provide two sleeping rooms, and the large door facilitates easy entry into the two rooms. For ample ventilation, there are six windows inside. Storage compartments are also available, and there is a polyester fly to prevent harmful UV rays from penetrating inside the tent. Floor seams and fly are sealed to resist harsh weather. With these superior quality camping tents, you can have the finest experience during your trip. So, choose the best product that suits your needs and budget, and enjoy camping with the whole family!